The Tabbed Data represents the values to be shown in the body of the final report. Specify tabbed data by dragging the corresponding field(s) from the list of Available Columns and dropping the field(s) onto the Tabbed Data grid. Reorder row headers within the Tabbed Data grid by dragging and dropping fields within the grid. In the example, to show the result and the qualifier, drag the REPORT_RESULT_TEXT and INTERPRETED_QUALIFIERS fields from the Available Column(s) grid onto the Tabbed Data grid. The following Result fields are listed in the Available Columns and are defined by the following. This field includes converted numeric results based on unit selections made in the Report parameter screen. This field includes converted text results (preserving non-numeric symbols and significant figures) based on unit selections made in the Report parameter screen. This field includes the original numeric results as they appear in DT_RESULT. This field includes the original text results (preserving non-numeric symbols and significant figures from DT_RESULT. After adding the tabbed data, it is possible to specify some additional options. The Caption column allows the specification of a caption that should be used for this value in the final report. This is useful when not using the actual field name as the caption. The Aggregate option is highly applicable to the results tab. The data can be aggregated with the following options. For datasets that contain a mix of numeric and non-numeric values, arithmetic aggregations (all aggregates except First, Last, and the Count aggregates) will proceed with the appropriate calculation while ignoring the non-numeric values. These results will be flagged with an asterisk (*) in the final Crosstab report. The Referenced Aggregate option allows the user to perform an aggregate based on another aggregate. For example, the Referenced Aggregate field is used to create a column in the crosstab based on an Aggregate (such as maximum results) which includes the referenced value from a related field (such as the chemical name or date or location of the maximum value in the aggregate column). Add the row with the Referenced Aggregate immediately following the row being referenced. Note that this feature does not work with the Average or Count aggregates, since they do not produce a data point to reference that exists in the dataset. Read more on the use of the Aggregate and Referenced Aggregate features. The Format option allows the user to include text to Tabbed Data. For example, in the Format field, add the value '. This will place the desired text into the crosstab results. 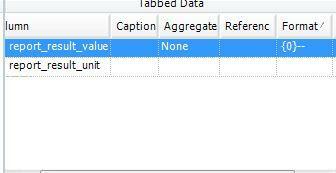 Note: The "Format" will not be applied if an Aggregate has also been applied to this Tabbed Data field. The Null option replaces any null values with the input value. For example, in the NULL field, add the text NA and all null cells in the crosstab will be replaced with the text NA.